I stayed at the Price Canyon campground on my way for a mountain biking weekend in Moab. This campground was at the top of Price Canyon but the access road was right off the highway. It is a single lane switchback road with the last quarter mile being easy dirt road so longer trailers may have a few challenges. It is a mixture of single and group sites all for the same price. There is a nature trail from the campsite (that is also accessible from the day use area) that takes you higher up the canyon. The hike was nice and I would recommend close toed shoes as the second half/ has a section that is pretty steep around large rocks/boulders, and loose dirt. I didn’t do the whole hike made it to the top of the ridge. There is also a picnic/overlook area not far from the campground that had great views of Price Canyon. This campground was $8. Which is the cheapest campground I found (unless it was free dispersed). Tent sites were tucked back off the road and short walks from the parking spots which made them feel more private. You didn’t have to watch your neighbor the whole time. They are pretty standard with a metal fire ring and picnic table. My spot had a few options for tents but I used the larger (or more designated) one. There were sites for trailers/campers where the tables were closer to the parking spots. Typical Forest Service pit toilets that were clean and stocked. Overall it was very peaceful and I will definitely be staying here again. No water (or at least there was none when I visited). I visited in May and they hadn’t turned the pipes back on from being shut off for the winter freeze. So be prepared with your own water just in case. *Lots of buzzing insects around. The bugs weren’t bad but you could hear the buzzing which was quite annoying. Tent sites are down short trails and not the flattest so if you have mobility issues it could be a challenge (but there were handicapped designated sites available). As a ranger for the Dyrt, I get the opportunity to test out gear from our partners once in a while. 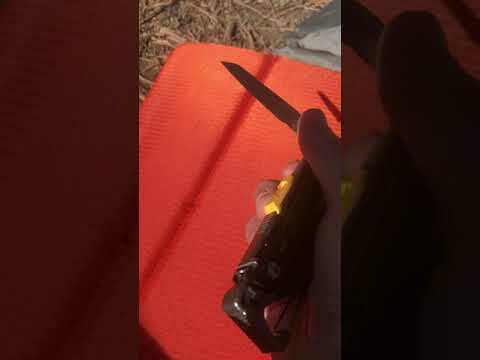 I have had the privilege of testing out the Leatherman Signal Multi-tool. First off, this tool is the bomb! It has 19 different functions and will pretty much be the go-to tool for camping or outdoor adventure. It is quite large so not ideal for light weight backpacking but great for car camping or any activity where you are not super concerned about weight. For the most part, it lives in the glove compartment of my car so I will always have it for quick use. The blades are really easy to access and also lock into place so you don’t have to destroy your fingertips getting the out or putting them away. I can flip out and in the knife with one hand. It comes with a belt carry case. I probably won’t wear it on my belt but the case does protect it (and the other stuff) in my glove compartment from banging around too much. It has become my go to tool for camping and general use because it lives in my car and is easily accessible. It is a multi-tool so it may not work for all situations. Sometimes it may be a little too big or awkward to use where a more specific tool is what is needed. It is good at a lot of things but not amazing at one or two. It is a little bit and heavy so may not be the best backpacking tool but that is a very limited negative. Summary: The Signal is one of the best multi-tools I have ever had and just having it with me whenever I am exploring outdoors makes me feel more secure in case something happens.